I purchased a 30" x 40" linear Fresnel lens, and built a frame for it out of 2" x 2" lumber. This frame is mounted on a wooden stand which allows me to tilt the lens to align it with the sun, and raise it about 60" off of the ground. The lens has a 42" focal length, and I'm currently cooking on a cast iron skillet placed on a modified heavy-duty camera tripod. When I built the cooker, my goal was to boil a quart of water in less than 30 minutes. I heat water in a 2" x 22" copper pipe, and can boil over a quart in about 20 minutes. After learning that I could boil water, I decided to try cooking food. The Fresnel lens can get VERY hot (I would guess 700+ F) so it's very easy to burn food with it. My current technique is to place food on the cast iron skillet, then put a bacon press over that. (Similar to a panini press.) Heating the bacon press instead of directly heating the food, spreads the heat out and minimizes burning. I can cook a hamburger, a few hot dogs, a grilled cheese sandwich and other foods in about 5 minutes. The design is a work in progress, and I'm looking to replace the lens stand with a table. I plan to build a parabolic cooker and a box cooker later this year. And, very nice job on your write up and description of your Fresnel lens cooker. I, and other site visitors, appreciate very much your descriptions of how you built it and especially how you have used it. ...very good submission, thank you for sharing with us. I am very much impressed to see design of Grill. Kindly let me know the dimension of Solar fresnel Lens and Lens supplier with approximate cost. I built a Fresnel cooker with a mirror that heated from the bottom - more like a conventional stove top. 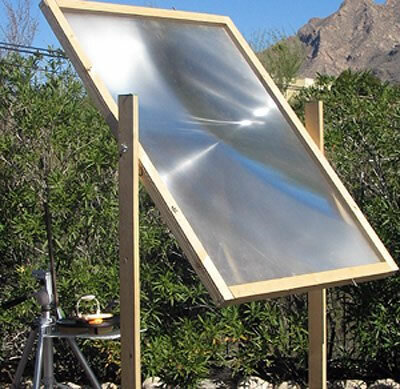 Unfortunately, I bought a Solar Burner parabolic from Solar Cooker at Cantinawest shortly after I built it. The Solar Burner worked so well that the mirror-Fresnel never got much use after that. What people fail to take into account is that cooking is done traditionally with the heat coming from underneath. You need to bounce all that light off of a mirror and reflect it onto the bottom of a sheet of metal. Essentially you'll have a flat grill like a short order cook uses. This will dissipate the heat across a larger surface, creating a hotspot and a varying gradient of heat all around it. This will also allow you to use your cookware in a traditional fashion, with the heat coming from underneath. You'll have one spot that is always on "High Heat" and other places where you should be able to slow cook. As it is, having sunlight directly hitting the pan from either top or bottom leaves you with no ability to control the heat, and the very real danger of reflecting that intense light onto yourself. But you don't want light, you just want the heat. FLAT GRILL. For the win. You could easily use two lenses at one time with a mirror. Set up one lens like normal, then set second lens up using a mirror to aim it. You get two lenses with full solar input, side by side, but aimed at the same cooking surface. Doubling the lenses on top of each other would definitely not increase the temperature, and would probably be more of an inconvenience when trying to find the focal point of the beam. The only way to really use two lenses would be able to use them separately but focus their beam on the same point. To do this however you would need to angle them beside each other in a way so that the lens is not perpendicular to the incoming sunlight, which would reduce their effectiveness. Basically you would probably have more focused light to work with but each beam wouldn't be as hot or as easy to focus individually. If you could manage to get the two beams to focus on the same point, it would probably maintain a high temperature better because of the increase in overall solar energy. But at the same time you would likely not see as high of a maximum temperature on the focal point. I don't think so. I think that you would still be gathering and concentrating the same amount of sunlight, so I don't see any increase in energy input. I wonder if you placed two lenses on top of each other,will their heat intensity double? The ideal fresnel lens for a box cooker? I retrieved a fresnel lens from a discarded large screen TV yesterday at a recycling depot for free. It's a 26" x 48" size, and is frosted on one side. At first I was disappointed about the frosting, because it diffuses the sun's rays a bit. But after testing it out I am actually pleased. Apart from the bragging value, there's no benefit in making a solar cooker from a clear fresnel lens that could easily vaporize your food. The frosted type focuses to an area about 6" diameter which is perfect for cooking. It still gets hot enough to burn cardboard but it takes a minute or two. I intend to make a solar box cooker with the lens as the lid and with angled interior sides, a bit like the SOS cooker in shape, so that the cooking area is about 12" round. I will try to get the lens to focus on this area, making it a more user friendly cooker. I will post some info on how it turns out. I want to know how can I use this approach to warm a room. Go to YouTube and search "fencekid free fresnel frame" for an instructional video on how to make your own frame. There are a lot of sellers who sell lenses in wooden frames to uneducated buyers for high prices. Projection TVs are trashed everyday everywhere. So stop the nonsense! There is no justification to charge $299 for a Fresnel lens just because you make proprietary claims. Look at their eBay auction descriptions. They are way overboard with the marketing tricks. You can buy and sell a lens for whatever price you want. For the rest of the un-offended population, we'll recycle old projection TV parts for Free. Have you tried putting two cast iron skillets, open sides together? I'd like to hitch one of these to a conventional stove somehow - using something cast iron as the heating element. I wonder how hot the box would get. If you wold be so kind, please forward any plans for this device yo may have; I have a 41"X 31" Fresnel, and would like to build something like you have. Hey all, there are people that throw away their old back-projection tvs, I found two tvs on the curb. All you need is a 1/4 in hex drive to undo the screws holding the tv screen or Fresnel lens. Yes, that's why they make this large fresnel lens, plus there are three glass lens, if you want them, in the back. So do not turn down a gifted horse in the mouth, strip and reuse those old back-projection tvs. I know several people who don't have easy access to Fresnel lenses who would pay a reasonable price for them. Can you post a link to your website here? I have had offers to build similar solar cookers for people, but tell them that they have to provide the Fresnel lens. I got mine online several years ago, and it was well worth what I paid for it. Stop paying top dollar for "professional" Fresnel Lenses. How silly. Search Craigslist for "projection TV" or "big screen television" and you can get these things for free. The screen of an old projection TV has a Fresnel Lens in it. Just avoid the HDTV types. Go for the oldest (pre-2000) models. Most people have no idea. Free knowledge. Free energy. Free FRESNEL LENSES!! I used to use a 2" x 22" copper pipe, exterior painted black, and capped at the bottom, to boil water. With my new setup (not pictured) I use a black 32 oz. stainless steel water bottle. Sorry, I don't have video, but I have some images here: http://bejoseph.com/solar-photos. Oh Oh Ohhhhhhh!, I'm sorry, is that what you meant by using a regular mirror? Yes, by all means you can reflect using a FRESNEL LENS and a regular mirror! I thought you meant cooking with a regular mirror alone, instead of a parabolic mirror...my error. Would it be possible to use another regular mirror to reflect the heat up to the bottom of the frying pan? I got the lens from a fellow solar cooker in the mid-west. He sold it to me for $60, including shipping. The lens is 30" x 40" and that seems to be a decent size for solar cooking. I wouldn't go much smaller than that the size of the lens plays a big part in how well it can cook. There is a company in Florida called GreePowerScience that sells large solar stuff, including Fresnel lenses. You can ofter find their products on E-Bay. Craig's List is another good place to check for Fresnel lenses. Where did you get that lense? Thanks for experimenting with solar cooking. It is a great way to cook and conserve our planet's resources. I have been looking for a source for a lense like the one in your photo, to experiment with in regards to solar cooking. Do you have information on where you got it and the approximate cost. I have looked at some websites with lenses. Mostly they were too small and I have no idea which type would be most effective for cooking. Any information would be helpful. We are a manufacturer of china and produce the fresnel concentrated lens. these products, please kindly contact us , we are very interesting cooperation with you on this line.